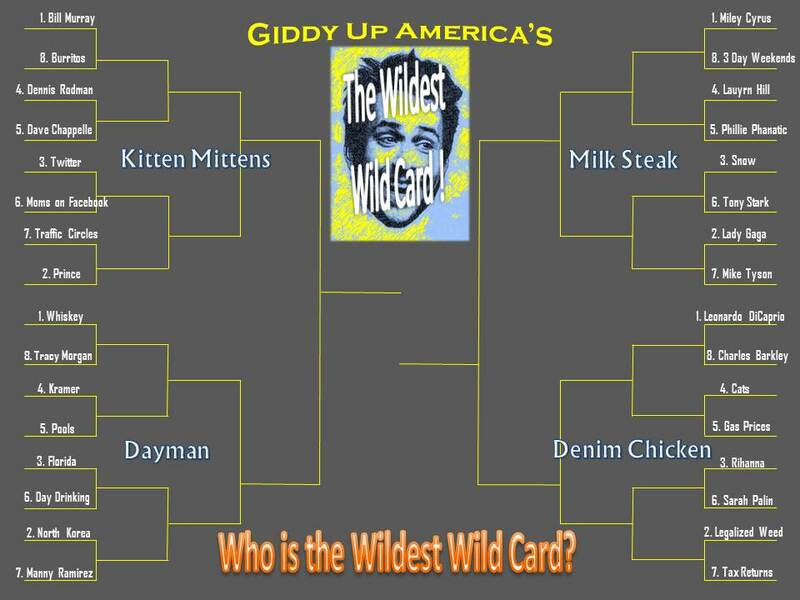 The tournament kicks off with the first round of the Kitten Mittens bracket featuring top-seeded Bill Murray versus Burritos, Prince versus Traffic Circles and more. Let’s get this Wildest Wild Card Tournament started. The sun is out, it’s not snowing, we need a break from checking Twitter to see if Revis has re-signed with the Patriots or not*. So giddy up indeed. We’ll get things started with first round match ups in the Kitten Mittens section of the bracket. You can check out the bracket HERE. With Murray sitting pretty as the tournament’s overall number one seed, burritos were really going to have to make some moves, win some hearts and minds and ultimately make a pretty solid case as to why burritos and not Mr. Bill Murray are a bigger & better wild card. Sadly this does not seem possible. Burritos…delicious, dangerous, unpredictable, differ depending on location, jammed packed (for better or worse.) The reality of burritos is that you really never know what you’re going to get when you order one. Portion sizes differ, styles of meat differ, quality of tortilla-folding differ. Burritos just vary on all accounts and they can do so even if you order two of the exact same burritos at one spot. Burritos are diabolical that way. Burritos keep you on your toes and it’s rare that a burrito doesn’t seem like a good idea. However, have you ever felt great after eating a burrito? You may have felt full; you may have felt satisfied. But have you ever felt better after eating a burrito than before? I only ask because I don’t think I ever have. I usually feel sluggish, full, lethargic. I feel like an uninspired balloon more often than not. Burritos also have a combustible element to them that make them equal parts frustrating and disappointing and unfortunately this is both an internal and external struggle. Yes, the struggle is real when it comes to burritos. I love burritos, but I sure as hell don’t trust burritos. And while that does make burritos a legitimate wild card, it makes them a dangerous wild card. There’s no way a dangerous wild card is going to upset Murray…at least not this early. Burritos go home, Bill Murray advances. If I were to ask you- do you think when Prince arrives somewhere, he does so by emerging from a cloud of smoke? – you probably couldn’t answer with any kind of certainty. But you also would follow up your answer with…I don’t know. Probably. Because yes, Prince probably does show up somewhere and emerges from a cloud of smoke. Why? Because he’s Prince and Prince doesn’t do entrances like normal people do. I don’t think Prince does anything like normal people do. Prince probably puts pants on, both legs at once. How does he do it? Who the hell knows! It’s Prince! Traffic circles, though? Traffic circles are terrible. Dear God I always wrestle with the idea of my untimely death at the hands of a traffic circle every time I’m in one. I’ll give them props for being the token wild card within the Highways and Roads Division (sorry rest stops, you’re not a wild card you’re just sketchy) but no, I don’t want to live in a world where Prince loses to traffic circles…even though something as insane as a traffic circle and the chaos that comes with it is something Prince is probably cool with. Hey Prince, we have four roads that converge here. Should we just design a traditional intersection- you know, with lights and stuff? No. The intersection should be a circle. Circles are funky. And thus, traffic circles were created…by Prince. So long Traffic Circles, Prince moves on. Dave Chappelle became a wild card when he abruptly left The Chappelle Show in 2005, flying away to South Africa days before the show’s third season was about to start because he needed a breather and to get away from the pressure that came with the show’s rise in popularity. He left a boat load of money on the table and was essentially off the grid for the next few years. In the past few years he’s started to resurface, doing high profile stand up shows and multi-night runs in New York City. He got a little testy with some rods up in Hartford but come on- who hasn’t gotten annoyed by some people while in Hartford? That’s excusable. 100% understandable. So Chappelle’s main claim to wild card fame is running away from $50 million dollars and hiding out in South Africa. That’s cool and all but it’s also no competition for Dennis Rodman. I don’t even know where to start with Rodman. Do we go back to his playing days, when he was easily the craziest dude in the NBA? Or do we reference his proclivity for cross-dressing? Maybe we’ll just talk about his spring break jaunts to North Korea and leave it at that. Hold up, wasn’t he on The Apprentice at some point? Whatever. Who cares? Dennis Rodman is such a wild card that he’s become a self-proclaimed ambassador of the U.S. to the most wild card country out there- North Korea. It’s like a wild card meeting of the minds, only to learn that neither one has a functioning mind! But hey, basketball is cool. Basketball will conquer all. I love Chappelle, but his accomplishments as a wild card dwarf in comparison to Rodman’s. Rodman advances, Chappelle goes back on the road. Both are a possible liability to your current and/or future employment. Both can be a source of useless information. 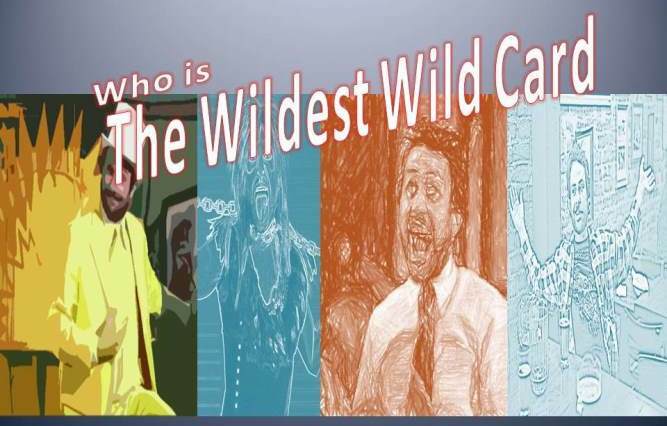 So who is the bigger wild card? Well I think it all comes down to how you view unpredictability and what really is or isn’t predictable in life. Twitter being ridiculous, you know that’s going to happen. Stupidity is one of Twitter’s main food groups. The fact that on Twitter you never know what’s going to happen is something that you take into account when checking Twitter. So therefore, it’s unpredictability is actually pretty predictable. Moms on Facebook, though? That’s a true wild card right there. Look back at the definition of a wild card from Oxford- a person or thing whose behavior is difficult to predict. That’s a mom on Facebook right there. One minute they might post something that their friend posted about daughters being a true gift and the next minute they’re telling you that your hair is too long or that you need to shave. Then they’re liking the Budweiser fan page with no recollection of doing it and posting blurry pictures of their grand kids. I don’t want to completely knock moms on Facebook, though. In the end it’s kind of funny and because they’re moms, nothing they say or do is all that harmful. Also, for every one mom on Facebook who is somewhat of a liability, there are four who are handling their online presence just find. Not all of the moms on Facebook are wild cards so therefore, the idea of Moms on Facebook being considered a wild card has too many holes in it. I thought we were headed for an upset there, but I had a change of heart. Twitter is just too nuts and rarely means well. Moms on Facebook are only occasionally nuts, but always mean well. Twitter wins, Moms on Facebook go back to liking CVS. No. Liking CVS on Facebook is a perfectly normal thing to do and if Moms on Facebook are doing it it’s because they’re smarter than the rest of us.